There is no sound in the world more precious than the carefree laughter of children. Nothing as heart-warming as the expression of awe and sheer delight on a child’s face when seeing something they once thought impossible. Year after year, these enchanting sights and sounds can be found at the Vancouver International Children’s Festival. 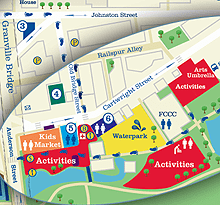 For far too many kids, however, a day at the Children’s Festival is beyond their imagination. When faced with the choice of feeding their child or taking them to a festival, many low-income families must prioritize the basic needs of their children over artistic and cultural experience. But what about those children that get left behind? Don’t they deserve to experience the joy too? We believe every child should have the enriching opportunity to see live performers, experience the thrill of artistic experimentation and be an active part of their communities. 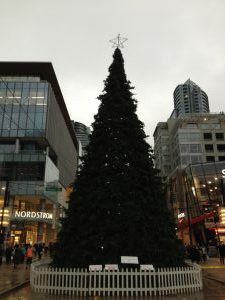 On November 30th during the Vancouver Christmas Tree Lighting at Robson Square, four magnificent holiday trees, one of which is 76 feet tall, will come alive with hope and light. Help us light the trees which will be lit until the first week of January. Buy a Bulb to help us bring deserving kids to this year’s Children’s Festival! You can purchase 5 bulbs for $5 or 15 bulbs for $10. Help us bring even more families to the festival than ever before. Please make your donation today! Our donation matching program runs until the end of December 2018! Help us reach our goal! We’re glad you asked! No, you don’t really get a bulb. We think of the bulb as a symbol of light and hope. When you ‘buy a bulb’, you are actually contributing directly to the Vancouver International Children’s Festival Society’s many Community Programs that enrich the lives of children and ensure the Festival remains affordable for everyone! When you buy a bulb, you help a family in need attend the Festival.